CLICK HERE to see a preview video of the Echo Bay Dory Skiff in action by OffCenterHarbor.com. PLease consider becoming a member of this site to gain access to so many more videos and a world of new knowledge. Plywood Kit includes the plans and 3 sheets of 6mm Okoume CNC-precut and partial sheet of 9mm Okoume. See what is in the Complete Kit. Echo Bay oars and sails also available separately. Echo Bay Dory Skiff spritsail rig. Lug rig also available. The flare of the Echo Bay makes her uniquely stable and seaworthy for a 12' skiff. The Echo Bay Dory Skiff combines the spirit and versatility of a traditional dory with the performance of a small sailing dinghy. Designed to be cartoppable, the Echo Bay is lightweight for her size, tipping the scales at only 85 lbs when built from a kit. This results in a skiff that rows and sails nimbly, and is exceptionally easy to move around, load, and launch. With her graceful sheer and classic proportions, the Echo Bay is as beautiful as she is seaworthy. Her safety and versatility as a sail and row trainer has made the Echo Bay a popular choice for local camps, father-and-son building teams, and family boatbuilding groups. Unlike skiffs designed to accommodate outboard motors, the Echo Bay is shaped for maximum efficiency under oar power. With her transom just clear of the water’s surface, the Echo Bay glides through the water with a minimum of disturbance. The Echo Bay won the fixed-seat class at the former Compass Project Rowgatta for several years running. With 50 feet of sail area – either sprit or lug rig – and an efficient daggerboard, the Echo Bay is rewarding for new and seasoned sailors alike. Both rigs provide the convenience of being easily set and struck, and allow for an efficient yet simple sail plan. Even with her spirited performance under sail, the Echo Bay can be sailed in challenging conditions, moving through rough water without the pounding typical of many flat-bottomed boats. No compromises have been made with regard to safety, and with optional airtight buoyancy tanks fore and aft, the Echo Bay will stay afloat even in the event of a capsize. The Echo Bay can be built from plans alone or from a kit, and is a great choice for the first-time boatbuilder. The hull is constructed of 6 mm Okoume plywood over stem, frames, and transom. With a traditional wood chine, very little filleting and fiberglassing is necessary, and a 2 inch glass tape on the exterior of the chines is all that is needed to seal and protect the hull. No strongback is required, greatly reducing build time and complexity through use of the Tab-n'-Lock system. The daggerboard can be built from plywood or laminated strips sheathed in fiberglass. Construction time takes 75 to 175 hours, depending on whether built from a kit or plans, and on the level of finish desired. Some have been built and launched in only two and a half days at the WoodenBoat Show Family Boatbuilding events. 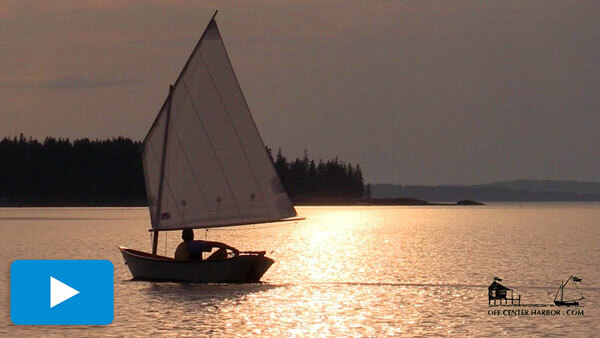 A recent sail in my own Echo Bay reminded me of the pleasure of owning a simple and practical boat. In just five minutes I was able to set up the sailing rig, stow the oars in their custom holders, and sail away from the dock. Whether sailing or rowing, built by the whole family or by an experienced boatbuilder, the Echo Bay Dory Skiff is a delight to build and rewarding to own. Unlike most flat-bottom skiffs, the Echo Bay does not pound in rough water and unlike many poorly designed flat-bottom skiffs, the Echo Bay's transom clears the water when rowing and glides along effortlessly. One owner of the Echo Bay brought his skiff for years to a rowing Regatta and consistently won the fixed seat rowing class. At the end of the day, you can put your Echo Bay away and look at it and appreciate how beautiful a boat she is with her lovely sheer line, flare, and shape of the transom. The Echo Bay is as beautiful a boat as it is seaworthy and easy to own which is one reason almost 40 boat plans have been sold and most built. The EBDS can be built from plans alone or from a kit and is a great choice for a first build. The hull is built wood-chine style out of 6 mm Okoume plywood over stem, frames, and transom. No strongback is required. The skiff can have buoyancy tanks installed into the ends of the boat or can be built with a solid seat arrangement. An efficient daggerboard is installed for either a sprit or lug rig built either from plywood or strips of wood with a glass sheathing. Construction time can be as little as 75 hours (many have been built and launched in 2 1/2 days as part of boatbuilding shows) and as much as 175 hours if someone is going for a high-end paint job.